With the Work to Play soccer season just starting, our players from Jordan Elementary and Bateman Academy traveled in full force to New Trier, where the high school boys’ soccer team facilitated drills and an exciting scrimmage. Our players enthusiastically took to the field and quickly joined the high school players in Junk Food Tag, Protect the President, and Keep the Dog on the Leash. Eventually, our players teamed off to engage in several fun scrimmages. Jordan, Bateman, and the high school boys from New Trier mixed together to create teams of varying ages and skill levels, ensuring that everyone involved made friends with people they had never met before. The best part about the day, aside from the super fun soccer and new athletic skills acquired by our players, was the connection between the high school players and the Work to Play teams. Despite geographical and age differences, Jordan, Bateman, and New Trier molded seamlessly together, creating a fun and engaging dynamic on the field. Boys’ Soccer Coaches Steve Berry and Brian Fischer, along with their New Trier team, served as great role models for our players, both in terms of advanced skills and sportsmanship. Each game ended with high-fives, piggyback rides, and warm hugs. Several Work to Play participants mentioned how they wanted to be just like the high school team someday. The New Trier team demonstrated to our players that with hard work, determination, and a positive attitude, they can achieve any athletic or personal goal. 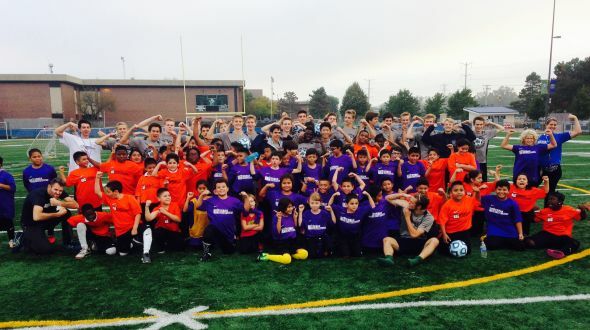 Urban Initiatives would like to thank the New Trier Boy’s Soccer Team, their coaches and staff for giving UI kids a wonderful opportunity to make new friends! Check out this COOL video the New Trier team made about our visit! Previous Article: 4th Annual Multicultural Cup!